Image caption The Crown Prosecution Service said there was "no realistic prospect of conviction"
The case against a man charged with attempted murder over a shooting has been discontinued, it has been confirmed. A teenager suffered chest and hand injuries in the attack in Radford, Nottingham, on 29 June. Kieron Saunders, 30, of Cardale Road, Nottingham, had also been charged with possession of a firearm with intent. 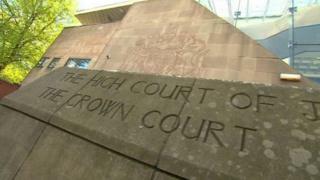 The Crown Prosecution Service said no evidence was offered at a hearing at Nottingham Crown Court on 6 March. A spokesman for the CPS said a review of defence submissions had led to the decision there was "no realistic prospect of conviction".